Last Monday no letter was sent to Ellen and Reid. It would have been too weird to arrive in Minnesota a day or so ahead of the arrival of the letter at Ellen’s house. Such a suspension isn’t entirely abnormal; no letters have been mailed the weeks I’ve visited either of the kids. Freedom from letters is okay once in a while. That once in a while extends to today. Nothing will be mailed. This will be two Mondays in a row where no letter has been prepared, the longest such stretch since I’ve lived in Charlotte. I am literally at a loss for (written) words. But mentally I’m already headed down next week’s path; Reid is thinking about grad school and I want to make sure it’s for the right reasons, and Ellen has her own stressors. 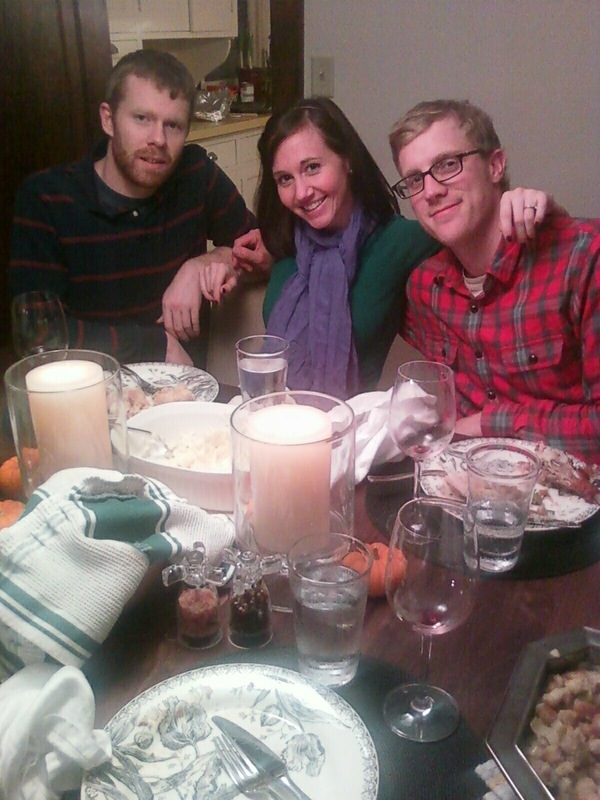 We had a good Thanksgiving week but the three of us are talked out. A break from the written routine never hurt anyone. Reid, Ellen and Tim in their post-feast, pre-nap positions at the table. It was 6F in Minneapolis yesterday and I’ve been too afraid to check this morning’s low (it is 18F at 10:45 which is no doubt colder than a normal person should tolerate). As it is I am in Ellen and Tim’s living room, Henry at my feet, to keep the string of posts alive. 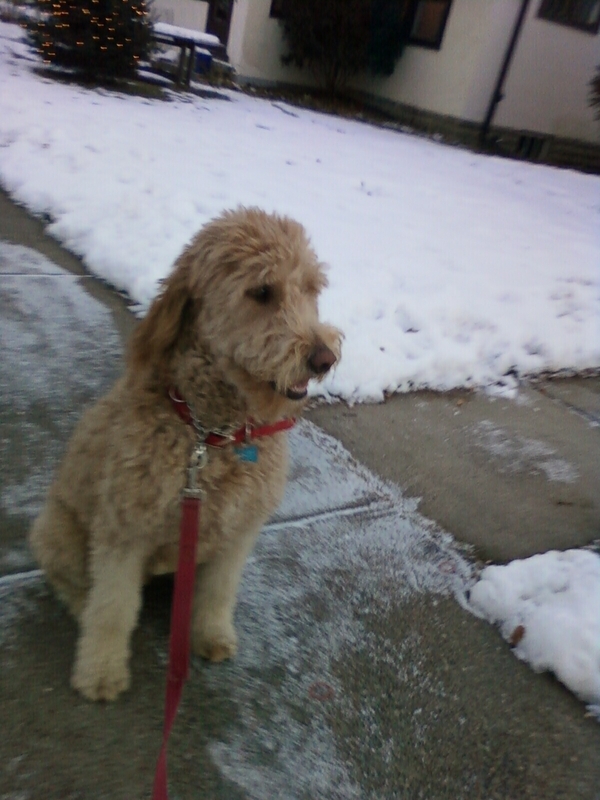 He and I just finished a frigid walk where he performed all the normal functions a well-fed dog should perform. Most Fridays a letter is composed to mom. I will write this week’s letter on the fly for you to see before mom ever receives it. It will be printed and mailed on Monday once I return to Charlotte (where the high today is forecast to be a balmy 65F). Mom: I’m writing this letter from Ellen and Tim’s living room in St. Paul. They are cleaning the floors while their dog Henry and I are lounging on the couch. It is really cold outside but what else would you expect in Minnesota in late November? They seem to like it well enough and their little house is cute and snug as a bug. Reid and I both flew in on Tuesday for the Thanksgiving week. We’ve had a great time of things. Not that we’ve done a lot except sit around and talk. We did go to a very bad, very forgettable movie the other night over at the mall. The mall, the biggest in the world, was almost empty the night before Thanksgiving, but the news reports said that the stores would open at 2:00 in the morning for the early shoppers. How nuts is that to get up in the middle of the night to go to a mall to shop? I did most of the cooking for Thanksgiving. The kids bought a fresh turkey, about 14 lbs., and it took nearly five and one-half hours to cook at 325F, and even then it wasn’t quite done. I’m not sure why it took so long but I think Ellen’s oven runs a little cool. But the other items, the potatoes, the stuffing and, most importantly, the gravy, came out just great. So the boys ate like boys and it was good to see everyone yak and feel filled. I baked pumpkin and apple pies from scratch and they came out pretty good, too. When people are hungry enough they’ll eat anything and tell you it was good. I called over to your other son’s house last night but you’d already gone. I’m sorry I didn’t call earlier in the day. But he said you had a good time and you were glad to see your great-grandkids. I’m still hopeful of getting out that way for Christmas. Today we will go get their Christmas tree and put on all the ornaments. They want to head out to a Christmas tree farm and cut one down. That’s okay. My little fake tree won’t go up until I get back sometime next week. It’s only about four feet high and doesn’t take much to assemble and trim. Well, mom, their dog is looking at me like it’s time for another walk, so out the door we’ll go so he can do his duty. You be good, stay warm, and I’ll see you sooner than later. Henry sits - momentarily - before our first walk on 11/23. He's a good dog. I’m camped this morning in a funky coffee shop across from Macalester College in St. Paul, Mn. If you wonder how far my stake is in the ground in Charlotte, look no further than the thermometer this morning. The low was a frosty 14F. On top of that I walked a frigid mile to find coffee (a six on the one-to-10 scale). The walk and the low temp both hammered the stake a bit further into the ground. I am surrounded by winter-hardy Minnesotans who think nothing of venturing out in such weather. Since I’m near to a strong outpost of academia, here is a bit of revisionist history: an older letter to Ellen and Reid (FYI…both are still snoozing this morning, but good for them). Henry insisted on a walk at 6:00 a.m. Who was I not to oblige? EB/Reid: You know, lots of odd things have happened to me in life; breaking a collarbone, eating dog food (just once), having two children, etc. But yesterday was about the weirdest thing that has happened to me in a long time, and certainly the weirdest since I became a Southerner. Someone took off with my loaded, filled-to-the-rim shopping cart. The local grocery store here is Harris Teeter, very nice, chic, see-and-be-seen type of Yuppie/Gen Xer place. So yesterday morning, I take my list to H-T and, starting in the produce section, go aisle by aisle, always looking for the deal. You know, 2-for-1 cans of soup, that sort of thing. So now, I am virtually all the way through the store, roughly the same size as Hy-Vee but much higher class. Sort of a cross between Dahl’s and Hy-Vee, with a little Palmer’s Deli feel. One of the final items on the list is bagels, so I momentarily park my cart and begin comparison shopping among shelves of wheat, plain and foo-foo options. When I find the half dozen on sale, I turn to my cart – it can’t be 10 feet away – and voom, it’s gone. The store is packed, and I know I let out some sort of expletive – “screw this” – or something equally foul because a little old lady squints at me and kind of turns her nose up although I don’t consciously remember saying “screw this” out loud. Who knows, maybe it came out worse. But my cart is gone and 45 minutes worth of analyzing a 12 oz. package of pasta on sale vs. the 16 oz package that is roughly the same price but not on sale has gone to waste. I’m not angry, just miffed, so off I go in search of the stolen cart. I go next door to the deli section, then wines, then foo-foo organic stuff. No cart. I mean, here it is loaded to the gills with stuff no one else could possibly want but me; cereal, apples, chicken, fresh basil, a fresh copy of Martha Stewart (no, wait, a copy of Martha Stewart Living will never touch any of my possessions), etc. So I head to the check out lines, hoping to bust the culprit when there it is, sitting there alone. Some poor schmuck had inadvertently taken it, tossed in a head of lettuce and some Miller Lite (I did replace those back on the shelves) and thought “What the hell did I just do.” So they abandoned it. I know I was muttering to myself the entire time, and that’s why people gave me a wide berth. Maybe some people find salty language offensive but not me. So the check out guy says ‘did you find everything all right?’ Oh yeah, pal, I sure found everything all right. Baked some of those round Italian loaves yesterday and went for a short ride in the 50F temps to deliver the goods to my boss (he just adopted twin girls from Guatemala) and my best friends Betsy and Bob. Of course, neither were home at the time so that ruined the effect of hauling in on the Harley. There aren’t a lot of bikers down here, just a few people who ride Harleys if you catch my drift. It’s odd not seeing more bikers tooling around. You can spot the faux Harley guys from a mile away – they all wear lace up boots. There’s no lace up boots in motorcycling. Sissies. Looking forward to T-Day. The paper said this morning 38 million people will travel this weekend, and 36 million of them will all try to board my particular plane at the same time. But I am looking forward to the Big Red routing the hapless Buffs. Big Corn beats Big Buffalo. Be good. There is a new economic reality for me these days. My bywords for the foreseeable future are don’t spend what you don’t have. Some might bemoan curtailed personal spending but I don’t need more stuff. I have just about everything I need. That applies to most discretionary items; golf and my bike chief among them. In an odd way, my continued 12-hour-a-day employment at the bank has staved off a couple of other possibilities outside the bank that would have let me get on with things. But by the same token I’m perfectly comfortable with the continuance. So last week’s letter to the kids is largely about economics, which, like politics, has national rumblings but is felt most heavily at the local level. Ellen/Reid: Suffice to say I’m excited about next week in St. Paul. EP, the prospective grocery list was sent last night and it should be pretty basic in terms of what we’ll need to have on hand. I volunteer to go to the market upon arrival in town. You’ll have your hands full with your work so don’t worry about things on the shopping end of the spectrum. Reid and I have that covered. For some reason I’ve begun to dwell on the end-of-the-year deadline of my employment here at the bank. The conversations I’ve had with those in my chain of command have only helped draw the conclusion that unlike the end of September, the end of the year will really be the end of things. My recent world has been on the correspondence end of things. It’s been a task to get my arms around the very protracted process of documenting customer complaints and responding to them on a point-by-point basis. We’re not very clear-cut or warm in how we write but that’s dictated by the legal beagles who seem to want our letters to be another link in the legal chain if and/or when the customer decides to, as we say in bank parlance, escalate their claim to the courts. Whereas I dreaded the onset of September, I’m not quite as fearful as I was before. Why that is I don’t know. It could be a numbing factor. There is something at the end of the rainbow it’s just not altogether clear what that might be. If nothing appears out of the blue toward the end of the year I won’t mind pounding the pavement. Both REI and Williams Sonoma were options but neither panned out once my hours reappeared at the bank. There was an article in this morning’s paper that was tantamount to preparing all of us for decades of diminished expectations economically. It will end up being an even more lopsided battle between the haves and the have-nots. Salaries won’t automatically rise year after year. The benefit age for Social Security will tick upwards. It’s really a sea change for workers and no one is absolutely sure with how it will all pan out. As luck would have it I’ve been among those who have not only tightened their belts but are also comfortable with that. I don’t need much to make me happy but just enough. That is the question that remains to be answered: how much is enough? As your uncle has told me time and again, retirement isn’t always about trips to Europe or gallivanting around the globe. (Honestly, I had my fill of travel with Meredith when you guys were growing up.) I’m sure there will be travel articles in the paper that would make me wish “I wish I could go there” but there won’t be many like that. What does give me pause is the mortgage. I’m down to about six years left on the original 15 year note (which I accelerated as much as I could). The car payment a little less so. The math isn’t entirely adding up although with John’s help the gap isn’t quite as onerous as it might have been as recently as a couple of years ago. But something is going to have to fill that financial space after the first of the year. Part of that belt tightening is staying here for Christmas. I wish it could be otherwise but it isn’t. You never know what might be ultimately up the bank’s sleeve but I don’t want to spend money I won’t have in February and March and beyond. Felicia will probably be here for some of that holiday time although it doesn’t really bother me to be here by myself. So don’t be concerned about that. I will have enough to keep me occupied. If push comes to shove the car ride to Grand Island to see your grandmother could be done in a reasonable couple of days. It’s about 1,260 miles door-to-door. I am anxious to see her in her new surroundings and see how she’s fairing with her new friends. Well, I still have a day job and I’d better get to it. See you guys in a few days and Reid, I’ll idle in the Minneapolis airport until you arrive so we can cab it together or bum a ride from your sister. My parent’s home in Omaha is empty. Gone are the furnishings, clothing, photos and other reminders of home. The memories, though, are still there. There will be no Thanksgiving or Christmas in grandma and grandpa’s kitchen. There will be no squabbles over picking at the carcass of a big turkey while my dad carved it. There will be be no frosted Christmas cookies that rated a 12 on the scale of one-to-10. The holiday spirit will be tempered this year by feelings of sadness held over from this past summer. But the somber tone will be offset by the hope that better days lie ahead. This year my mom makes the short jaunt across town – all the jaunts are short in Grand Island – to spend both holidays with my brother and his wife, Gayle. Some of the grandkids will pile into town, too – a certain diversion for what ails the family. I’m hopeful to drive out West for Christmas. I just want to get in the car and go. However, the next few weeks of letters will beat me to her doorstep. Mom: This time next week I’ll be in Minnesota with Ellen and Reid for Thanksgiving. Ellen sent me a message last night to bring my long underwear and plenty of other warm clothing. The low temperature in St. Paul last night was supposed to be a frosty 21 degrees. That’s a whole lot colder than it is right now in Charlotte and it feels cold enough here. Folks up in Minnesota say they like the cold weather but I’m not convinced of that. That’s why everyone ends up moving to the South. Ellen says I should prepare to do most, but not all, of the cooking. Reid has raised his hand to help out (he’s actually pretty good in the kitchen) and for the first time in a long time I think we will be drinking beer as the turkey roasts. I told her about your advice to me a long time ago: buy the cheapest turkey you can. We will be sure to remove the neck and gizzards before cooking (I’ve forgotten to do that more than once over the years). I’m not sure we can cook the bird to the same quality that you used to do year after year but we will give it our best shot. We’ll let it roast for a few hours with tin foil on, then remove the foil with about two hours to go to let it brown. Reid thinks he’s the king of making gravy so we will see how that turns out. He and I cooked a turkey a couple of years ago in Hilton Head and he did a pretty good job then on both the turkey and the gravy. I will buy all the groceries once I get to Minneapolis. I head out on Tuesday morning. Betsy and Bob will give me a ride to the airport. Ralph says you’re going to be over at their house for Thanksgiving. That sounds like a lot of fun. Aren’t your great grandchildren supposed to be there, too? I wish I could be there with you guys, but it just won’t happen this year. I will try to make it out for Christmas. Looks like I may drive out rather than fly. It’s a smooth two day drive and not as many miles as I thought it would be. You’d better be good or you’ll find coal in your stocking. Gee, where have I heard that before? Been putting in a lot of hours at work. Usually leave about 7:30 or 8:00 in the evening but the work is enjoyable and I like it. What I don’t like is that it gets dark so early these days. I go to work in the dark and come home in the dark. But that’s just the way the cookie crumbles. I’ve talked to your brother a couple of times in the last two weeks. He sounds great and he’s always asking what I’ve heard about you. Come to think of it, I need to send him the photos of you guys swigging beer at some joint there in Grand Island. Good for you guys to have a cold one now and then. That looked like a lot of fun. I’ll crack open a beer tonight in honor of you and your new buddies. Well, I’m off to get some work done. Need to show I’ve earned my spot on the payroll. Have a great Thanksgiving and say hello to everyone! My twin brother Ralph and I used to go back and forth at each other on just about anything. We couldn’t push the needle in far enough or often enough. I’m surprised our parents didn’t give up on parenting at an early age. But all of that good-natured sparring changed quickly this summer (indeed, most of the past 24 months). Our daily conversations held little room for levity as we inevitably shifted from care for two aging parents to how we would tend to our widowed mother. Ralph has carried virtually all of the load when it comes to watching over mom. He’s shouldered it all; medical appointments, her move closer to him in Grand Island, plus his daily visits and short weekend jaunts to get mom out of her pleasant but cramped room. It’s worn on him. I can tell. But as you might have seen last Friday (November 12) there is a ray of sunshine. Mom is feeling better, her moods have flattened out, her medications fine-tuned to her needs. I haven’t written Ralph about all that’s gone on, notably on his end. But I did last night before I left work. Bro: It is just amazing to see the photos of mom and the other oldsters that Country House e-mails to family members. It is just incredible to see her smiling and having a bit of fun for a change. Was that a shot of her drinking beer at some establishment? At least they don’t have to check their IDs before serving them. Dad had his MGD and mom has whatever it was she was having. Good for the staff to get them out of that place for a little while. That’s been a great move to get her out of Omaha and closer to you guys. Not that Lakeside wasn’t nice enough but it just didn’t put her close to the remaining family that she has. It would’ve been extraordinarily tough for you and Gayle to traipse back and forth to do the errands and such. You already had put enough miles on your cars. I wish I could be closer to help out, but I’m not. I don’t know what strings you pulled on the medications, but you pulled all the right ones. She just looks calmer, happier, and more even. What the hell was the concoction she was on? I’m still not sure what she was taking or how dad or Lakeside kept track of it all, but something is apparently going right at this point. I’m still up in the air about Christmas. If it is at all possible, I will get out there somehow, some way. Things look to truly be drawing to a close here, and if that is the case then I very well may bolt early and drive out. There just isn’t much of a future at the bank. They’ve had their fill of me I’m sure but the extension has been good. Mapquest shows it as a shade over 1,200 miles and that’s really doable in a couple of stiff days. I suppose it will be weather dependent in part. Probably 700-800 miles one day and 400+ the next. That would get me into GI around dinner time on whatever day it will be. I’ve got to figure out a way to make a stop in Omaha to remove the belongings from Pete’s place and get it over to Des Moines at Kathy’s house. She still owns it although her time is really in California now. Things can stay snug and secure there until the kids have adequate time to claim it. Reid seemed to enjoy his time with Andy and Steph and your grandbabies out in Palo Alto. He seems to be warming to that place but the cost of living would be well beyond him right now. I wouldn’t put it past him to try to figure out a way to shift his life West. I keep thinking his stake is firmly in the ground in Chicago, but as I found, there is life beyond the borders of the Midwest. I haven’t seen any photos of the birthday party but some will probably surface sooner than later. I am excited about St. Paul for Thanksgiving. Ellen has had a tough go in the school system. As Gayle knows, it’s not so much about teaching but about preparing for tests. That’s been a real drag for her and she spends a ton of time at the school prepping for things or doing obligatory paperwork. Tim seems to keep her pretty grounded although his 3M job keeps the boy moving all the time. That’s okay. Well, I’m gonna sign off. It’s 7:15 here and I’m ready to leave the office. You guys be good, and thanks for all you’re doing for mom. My guess is that she appreciates it, and I know I do, too. Go Big Red. I’ve not opened up very much – make that not at all – with Ellen and Reid about the weeks and months since my dad passed away on June 28. The three of us – mainly me – have danced around the topic. Any reference to the event is couched in terms of how their grandmother is faring out West. As a rule I’ve tried to keep emotions in check when it comes to my dad. But his photo hoisting a cold glass of Miller Genuine Draft shortly before his death (June 11 post) is my screen saver on both my laptop and cell phone. So his image is never far away – to say nothing of his place in my heart. For the most part the approach of bottled up feelings has worked. But as many of you have seen in your own similar circumstances, even the slightest little thing can open the gates. This week’s letter is, in part, about what I’ve thought about in the past several months. I don’t know what they will make of reading this letter. Chalk this up as residue from Betsy’s lecture. This new bare-all ground for me, not that it opens anything morose, but expressing these sort of emotions has been outside my comfort zone. If either of them respond, I’ll share what’s fit to be shared. Ellen/Reid: Pretty frosty here this weekend. We got blasted with near record sub 30 temps this morning. Not what the locals are used to. It should be back in the 70s by the end of the week. Word came this weekend that your grandfather has a formal headstone. I will ask your cousin Joe to send me a photo when it is installed. I would give anything to be there for that just so I could be close to him again. As it is, the best I can do is your grandfather’s photo as my screensaver on both the laptop and cell phone. He’s toasting viewers with one of his final MGDs. The pages reminded me of how much I miss your grandpa. Every now and then there will be some out-of-the-blue, small reminder of him. It’s hard to think that I can’t pick up the phone and talk to him about what I need to do in this or that situation. I didn’t go to him all that often on things, but when I did he usually had the answer I needed to hear. He was a pretty smart guy in lots of ways. Those last days with him were surreal in a lot of ways. It was emotional but not teary for me as I watched him slip away. The two things that bothered me the most were watching him eat alone in the cafeteria. That is no way to spend your last days. He could’ve used a friend right then. That was very hard to bear. And then to watch him need help to get into and out of the bathroom was just heartbreaking. He had lost so much weight. The disease had taken him down to nothing. Honestly, in the end it was a relief to see him finally get some rest. The one time I truly broke down was when I stepped outside to call the both of you. I don’t know why that made me so uncontrollably weepy when I couldn’t summon that emotion in all the prior weeks. It must’ve just been a sense of finality. Someone smarter than me could probably explain it to me. Your grandmother has never mentioned him in any of our conversations. Maybe she has moved on or her memory has not allowed her to adequately process the loss of her husband. Perhaps that is a good thing. None of us will really know what’s she’s thinking. I have yet to mention or even allude to him when we talk. I’m afraid to see what her reaction might be. If she mentions it I suppose that is an opening. It’s hard to believe almost five months have passed. If the possibility comes up I would like to drive her from Grand Island to Omaha to see the headstone. That could be a sense of closure for her. I don’t know. But she deserves to see her husband at least one more time. I think it would be good for her to get in the car and just go. Well, I’d better get along. My stretch here at the bank is over after Christmas and I’m trying to build a best-case scenario for working beyond that. But you never know. I’m excited about Thanksgiving and HR has given me the green light to go. I’ll be in touch about arrival particulars very soon, but Ellen, I don’t mind sticking around the airport until you can come fetch me.